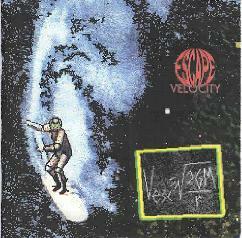 Escape Velocity - "Vesc=squareroot (2G*M/r)"
Surf SpaceRock? You betcha. From Dayton, Ohio, Escape Velocity play songs that sound like the B-52s meet the Ventures, but others that have a clear Hawkwind influence. The band is a trio of Digger Dug Doug on keyboards and vocals, Dr Gavin Atomsmasher on guitars, bass, drums, and vocals, and Tom So$ also on guitars, bass, drums, and vocals. Songs like "Your Weapons Are Useless" and "Beaches Of Planet X" have a strong surf meets B-52s with a 60's edge sound to them. And "Surf Till You Die" shows that the guys really have a sense of melody. This is a standard 60's style surf tune but with synth lines looming eerily in the background and brief doomy vocals. "When The Sun Explodes" and "Gravitational Constant" sees the band exploring a kind of surf-Hawkwind territory. Digger Dug does his Nik Turner vocal thing to the beach hoppin' dance beat. These could easily have been ICU tunes. "Landing Pad" and "Dark Unknown" bring the band into an even heavier, almost doomy, Hawkwind realm. In fact, the guitar bit near the end sounds like they're going to launch into Time We Left This World Today. And finally, "Donner Colony" is a punkish tune that gets way psychedelic with its trippy wah guitar. Lots of good spacerockin' and surfin' fun. I want to see a double header show of these guys with Martian Death Lyric. For more information you can visit Escape Velocity at their web site.